Wasn't you driving through Hebden Bridge today was it? @liam I’ll try to hunt the eBay link out if you want? Was there much damage to yours? Smashed the splitter on the jack that goes across the ramp. I saw him do it so let him know I'd seen it, he walked round the front and said no I never touched it and there's no damage. Then 10'mins later came to me with a chunk of my front splitter in his hand Id already googled the price of a new splitter to show him on my phone so he had no choice but to give me £140. Ohh you’ve had no luck with splitters. At least you seen him do it even though he denied it at first. 2018 Mk4 1.4TSi - Golf GTi MK7 Tartan Front Seats, TRC Front Splitter, Coilovers, 19" Wheels, Sound Proofed and Carpet lined rear. Cab Carpet in the front. Kenwood DNX525DAB and a Shark Fin Aerial. Caddy Life Door Mirrors. Cheers @Mark. It’s getting there slowly. Managed to get it Mot’d yesterday and it flew through . Also yesterday, tried to have the flashing oil sensor coded out on start up, I don’t have a sump sensor, and we couldn’t find it. 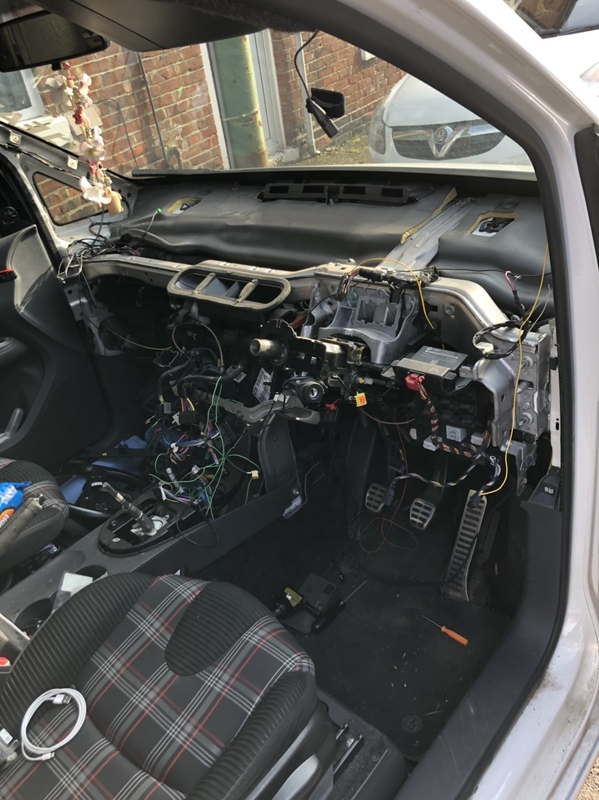 Also tried to get to the bottom of what caused the heater to blow a fuse and came back with a blank and whilst doing this discovered that the cecm is not communicating with the drivers door window and central locking. But door warning lights, electric, heated mirrors work and the central locking off the button inside works. Wondering what could cause this? Also last week dropped my alloys off to be powder coated and they were ready yesterday but couldn’t get up before they closed. Not been up to much lately, but have collected my alloys from powder coating. I’m waiting for the new centre caps to be delivered before fitting them. Also last week I dropped my head unit back as I’ve been having problems with the Bluetooth since early November, I’ve tried all what I’ve been told including the update and now waiting to see what pioneer have to say.